18 December 2014. Engineers and medical researchers at University of California in Los Angeles designed a new type of microscope that combines holograms with computational techniques to generate images of pathology samples with quality comparable to lens-type microscopes. The team led by electrical and biomedical engineering professor Aydogan Ozcan published its findings yesterday in the journal Science Translational Medicine (paid subscription required). Four of the paper’s authors, including Ozcan, filed a patent application for the technology. 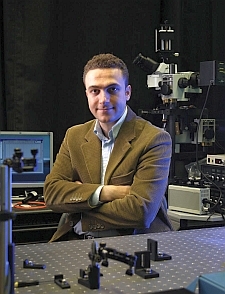 Ozcan also co-founded the company Holomic LLC to commercialize mobile lens-free holographic microscopes and other medical optic discoveries. The UCLA team is seeking a simpler and less-expensive alternative to traditional lens-based microscopes, particularly for point-of-care diagnostics in low-resource regions. Not only are conventional microscopes expensive, they have a small field of view that requires recording multiple images from larger specimens, such as tissue samples. In addition, advances in optics, sensor chips, and computational techniques reduced many obstacles, including costs, of applying these technologies to microscopes. Ozcan and colleagues use light-emitting diodes or lasers to illuminate the specimen on a slide. An array of sensors on a microchip, similar to the kind found in smartphones and digital cameras, then records the patterns of shadows from the slide. Those patterns are processed into a series of holograms, two-dimensional surfaces that display precise three-dimensional images with a field of view 100 times larger than conventional microscopes. One of the continuing obstacles faced by developers, however, was the inability to generate clinical-quality images from holograms, for which the researchers devised algorithms to overcome. The computational techniques reconstruct recorded images that can be 3-D digitally focused to any depth within the field of view, without mechanical focus adjustments, and can correct for tilting or height variations in the specimen. The algorithms can also add or enhance coloring without manual adjustments. The researchers tested the hologram-microscope with large area beast cancer tissue samples, Pap smears indicating cervical cancer, and sickle-cell blood samples that returned images with enough resolution and contrast for clinical evaluation. An independent review by a pathologist of 75 hologram- and lens-based microscope images of breast cancer tissue showed an accuracy of about 99 percent for the hologram device. The authors note their hologram microscope may have a simpler low-cost design than conventional lens-based devices, but it still needs more refined and packaged software, including user-friendly controls, to make it operational for end-users. They point to a comparable early stage in the development of personal computers, however, foreshadowing wide-scale adoption of that technology.